The older I get, the more I think it’s all about courage. When we find new and creative ways to instill courage into the lives of our kids – they win. And, I’m not really talking about “getting ahead”. I’m talking about the small things of life. Looking out for the little guy. Teenagers, of all the people in this world, are positioned well to live with courage. For the most part, people don’t depend on them for their livelihood, so they can explore, make mistakes, and pivot when necessary. Within the bounds of the law, the consequences for failing tend to be less than adults who have families and careers. Teenagers tend to see the world with more naive and hopeful eyes – issues that can be solved or addressed with just one good idea. While those who are older roll their eyes and pat on the head – teenagers seem to expect their actions to actually make a difference and change environments. The adolescent years are the perfect space to live courageously and with meaning. Those who do gain experiences and tools to do so as adults with families and careers. They know what it means to try and fail, doing so with the protection and support of the loving adults in their lives. That’s where you come in. When the teenager you love comes to you with a wild and crazy idea – help them figure it out. Support them. Ask good questions. Help them take it a step further. What would things look like if we lived with a little more courage? 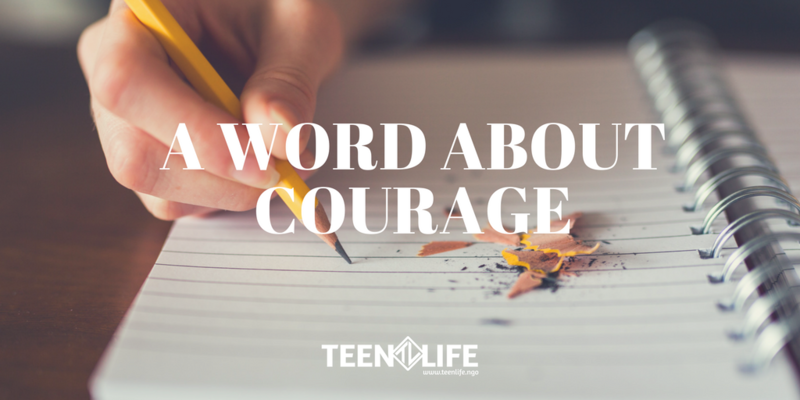 What would it look like for the teenagers in your life to be more courageous? I think we can all agree on that answer. Chris Robey, Teen Life’s Program Director, has worked with teens for over a decade and strives to help students see the best in themselves.